ZaoProteks have strong capabilities in product design, development, production and quality control , provide multifunctional and professional work gloves, gardening gloves, welding gloves, welding jacket, welding apron, welding spats , provide professional protection for your hands and body. 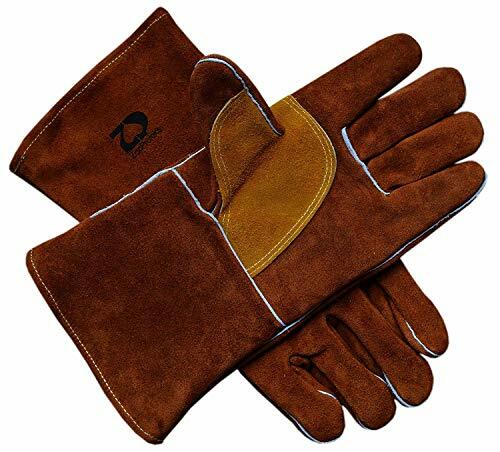 ZP1708 Heat Resistant Cowhide Leather Welding Gloves which are fully made from high-quality durable cowhide leather, Comfy inner lining to ensure absorb sweat and add durability, it's great to protect your hands for welding, stove, gardening, camping , barbecue, BBQ, cut resistant , fireplace, hearth, grill, oven, gilling, foundry, metal casting, steam, sharp edges , and it's ideal for home tasks, cement factory, petrochemical and refining, glass and ceramic manufacturing, laboratory testing facilitie,welding and heat resistant industries. COLOR and SIZE (L x W ) : Brown , 13.5 x 6.8 inches, One size fits all of you. MAIN MATERIAL and FEATURES : Pure cowhide leather with double stitching to provide high abrasion resistance, Fully cotton inner lining to absorb sweat and add abrasion resistance. FLEXIBLE DESIGN : Reinforced wing thumb design for maximum flexibility, holding items and operate easily. HEAT and ABRASION RESISTANT : Potect your hands in contact with high heat, rough, sparks, sharp , flame object and so on. DURABLE and MULTIFUNCTIONS : Offer high temperature protection with abrasion resistance, it's great to protect your hands for welding, stove, gardening, camping , barbecue, BBQ, cut resistant , fireplace, hearth, grill, oven, gilling, foundry, metal casting, steam, sharp edges , and it's ideal for home tasks, cement factory, petrochemical and refining, glass and ceramic manufacturing, laboratory testing facilitie,welding and heat resistant industries. If you have any questions about this product by ZaoProteks, contact us by completing and submitting the form below. If you are looking for a specif part number, please include it with your message.